In this issue of 3D Artist : 3D Artist is an authoritative and well-respected source of inspiration for those working or aspiring to be working in the CGI industry. 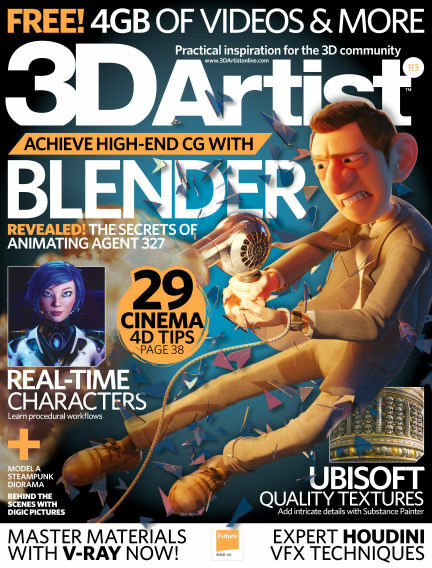 Each issue is packed with advice and inspiration for 3D devotees, all written by first-class artists. The step-by-step tutorials give readers valuable insight into the techniques used by 3D professionals, while interviews and features focus on the latest projects being created by commercial studios and freelancers. 3D Artist looks at all 3D disciplines, from VFX, games development, architecture and product design. Every reader now has access to FileSilo.co.uk the ultimate asset bank for every tutorial file and free resource from each issue of your magazine. Go to www.filesilo.co.uk/3Dartist to start downloading your FileSilo resources today. With Readly you can read 3D Artist (issue Issue 113) and thousands of other magazines on your tablet and smartphone. Get access to all with just one subscription. New releases and back issues – all included.